A sprawling exploration of genetic theory, as traced from Gregor Mendel’s ideas of heredity and Charles Darwin’s concept of evolution to today’s biotechnologies. The possibility and the ethics of breeding “better” humans is at the heart of Tudge’s (The Second Creation, 2000) latest work: “When anything is possible, we have to ask as a matter of urgency: So what is right?” Gregor Mendel spent eight years hybridizing garden peas and analyzing hereditary factors; his work laid the foundations of modern genetics. Yet his scientific contributions went unrecognized during his lifetime, in part because of an existing religious climate that was at odds with the scientific community. Just as Christian orthodoxy deeply influenced the climate of Mendel’s mid-19th century, so, too, does Tudge’s rhetoric conflate modern biotechnology with hubris. He discusses two trends in genetics: preventive medicine and transformative technology. In the first, medical knowledge is used to reduce the impact of single-gene disorders, such as cystic fibrosis or Tay-Sachs disease, in a single individual. In the second, genetic technology (in theory) could be used to correct genetic defects in embryos in vitro, an action that would affect subsequent generations. While supportive of the alleviation of suffering, Tudge is opposed to manipulation of the species, and he deems those so interested as selfish and morally perverse. His study contains many interesting details, especially in the chapters discussing Mendel’s work and how his resulting trials ran afoul of university examiners during his repeated attempts to receive a doctorate and teaching credentials. Also interesting are the author’s thoughts on how biotechnology can help the wildlife conservation effort, and what the concept of “designer babies” could entail. His inquiries into the morality of biotechnology rely heavily on his own personal feelings, however, and are likely to strike many readers as unconvincing. 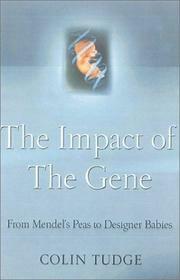 An engaging and comprehensive analysis of genetic theory with occasional lapses into technophobia.